I have been practicing TNR – Trap, Neuter, Return, in my yard and helping out others in my community with cats in their yards since 2004. You may have found this site because you have cats in your yard as well. 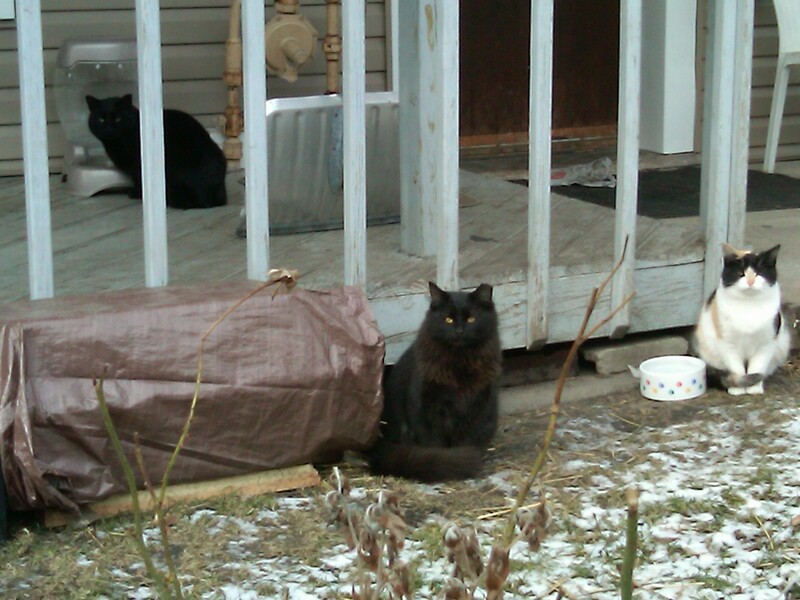 TNR is the most humane method to help stabilize the feral and outdoor cat population. You trap the cat using a humane trap baited with food, take it to a low-cost veterinary clinic to be vaccinated and spayed/neutered, let the cat recover in the trap for a day or two, and return it back outside to where you trapped it, letting them live out their lives the way they already know how. During their surgery, the top of the left ear of the cat is snipped off, called eartipping, so as to identify it in the future as already being fixed. A few weeks ago I started jogging outside around my neighborhood. You notice a lot more things when you’re on foot. Right now I’m noticing a lot more outdoor cats, but that’s also because I know where to look, and I can’t help myself. Yet I was stunned to find a colony of three outdoor cats just a block away from me right on the front porch of a single-family home. They had food, water and shelter. What really made my day was that all three cats were already eartipped! More and more people are practicing TNR every year. I tried to speak to their caretaker, but there was a language barrier. Many families in my area predominately speak Spanish. I can’t speak more than conversational Spanish, and I think the caretaker knew I was talking about the cats, but I couldn’t figure out who TNR’ed these cats. Finally, I just pointed at them and said, “Bonita!,” which made her laugh at least. And so, I christened them the Bonita Colony, an example of how TNR not only saves the cats’ lives, but with the help of a caretaker, makes their lives outside easier, healthier, and a whole lot prettier. We've got food, water, shelter, and medical care. We're just fine out here. Thanks for admiring us!